My mother’s cooking took to the stage when we moved to Canada in the late-seventies and that’s when I really discovered how well my mother cooked. Before that, we lived with my grandmother and she did most of the cooking. Since my mother was working she helped when she could. This recipe evolved over the years as I first recalled my Mother’s recipe (included as a footnote) and then built on that. My wife also had a great influence as she suggested adding turnips, it was a fantastic idea. The turnips add a great earthy element which screams countryside to me. 2 lb. cubed stew beef (cut into 1/2-inch cubes) (use lamb for that authentic flavor, or veal or any combo of beef, lamb and veal or all three). Stew Beef – Marinate stew beef cubes in 1/2-3/4 cup wine, about 1/8-1/4 cup Worcestershire and 1/4 cup balsamic vinegar for about an hour, Remove marinade and set aside. Coat cubes with flour, salt and pepper. Garlic, Onions and (optional) Crushed Dried Hot Pepper – Crush the dried hot pepper using a mortar and pestle and then dice the garlic and onions. Carrots, Celery, Mushrooms and Turnips (or Peppers) – Slice carrots celery and mushrooms, the turnip cubes should be 1/4 to 1/2 inch cubes. 1. In a Dutch oven sized pot, sauté the onions, garlic and hot pepper flakes (optional) in olive oil and bacon fat (optional). 2. As garlic begins to brown and onions start to become translucent toss in floured and seasoned stew beef cubes. Throw in some more Worcestershire if you like and let meat brown (covered) for about 10 minutes or so. 3. As the meat and onions cook, add the carrots and celery followed by the turnips (or peppers). Let the carrots and celery soften, it takes about 5 minutes or so. 4. 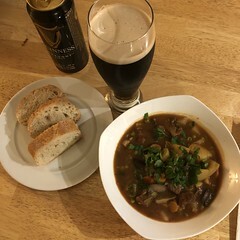 When the vegetables begin to soften add the beer (or wine) along with the marinade you had saved; cover pot and bring to a simmer (stir often). 5. After about 5-10 minutes, add the sliced mushrooms. 6. Once the mushroom begin to soften, add some butter, the bay leaves and celery leaves (if you managed to save any). 7. Once the stew comes to a simmer again, add 1 cup of beef broth. 8. Let come to a simmer and add the tomato, mix well and cover pot to allow it come to simmer (stir often). 10. Add some more butter if you like and another cup of beef broth if you like. 11. Once stew comes to a boil again, it’s time to add the peas and 1 cup of the saved potato water. 12. Finally, on the last cycle, add fresh chopped flat-leaf parsley, salt and pepper (to taste). Cook on low for an additional hour or two (if you can). If more liquid is needed due to reduction, add an additional cup of the saved potato water or beef broth. In a large pot, add Olive Oil, Stew meat and stir until brown. You can prepare cubed Stew Meat by covering them with a thin layer of Flour. Add Vegetables, Tomato Sauce and enough Water to cover. Add crushed Garlic, Basil, Salt, Pepper, Bistro and Kitchen Bouquet. Cook for about 1 to 1-1/2 hours.